Drama. 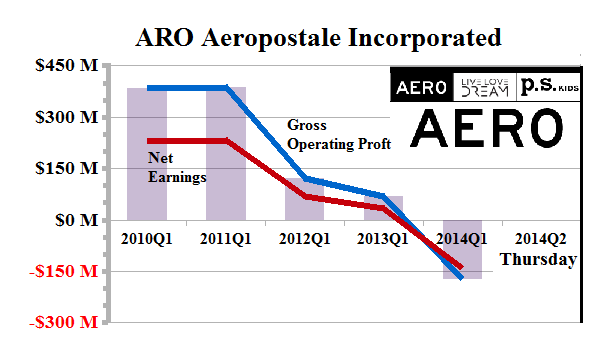 Aeropostale has a new pilot, Mr. Julian Geiger, who returns and replaces CEO Thomas Johnson, of less than four years at the helm (BusinessInsider, August 18, 2014, Aeropostale’s CEO Is Out And This Horrific Chart Is His Legacy). Yes, it’s true that the stock price has lost more then 85% of its value during that time (ibid, BusinessInsider). And, yes, it’s true that the gross operating profit and the earnings have descended even faster; please see Figure 1 on the left and Exhibit 2 below for the Risk Price Chart. The Risk Price (SF) has kept us out of it, and it does so now at $9, even though the stock has been trading aggressively for the past few days between $3.50 and the current $3.25. It doesn’t pay a dividend, and our estimate of the downside in the stock price is minus (-$2.50) in the next quarter, based on the demonstrated stock price volatility. Nevertheless, the fundamentals are not atypical, and the store is very comparable to the other brand-name stores in the U.S. retail industry – which might one day be popular again – please see our recent Post “(B)(N) BONT Bon-Ton Stores Incorporated” for additional speculation on the sector. 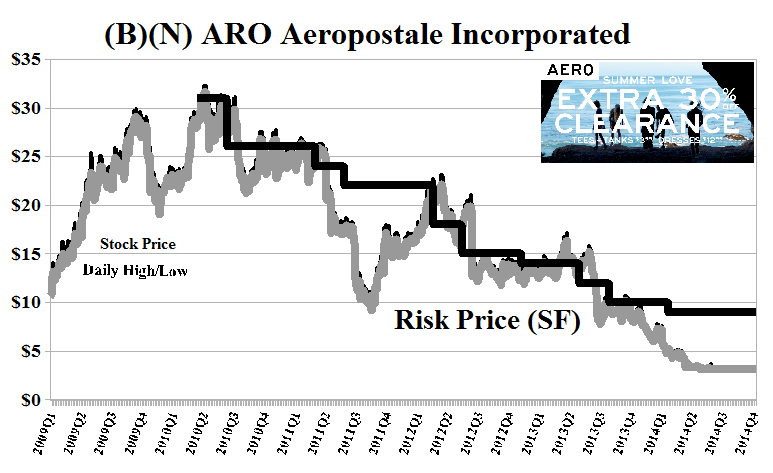 Aeropostale has the strongest balance sheet, with a modality of α=1.61, and the risk to the shareholders equity (N/N*) is negative (-0.27) which is the best, and next to Best Buy (-0.07) and J.C. Penney (-0.47). These companies become investments once the risk is positive – and we know how to deal with those – safe, liquid, and hopeful – those are the words that move us. However, the facts seldom deter investors from doing what they will, and praying for a good outcome – which happens about half the time – and the next “half-time” is on Thursday (this week). But the clothes, the clothes – are amazing! Aeropostale Incorporated operates as a mall-based specialty retailer of casual apparel and accessories for young women and men in the United States. From the Company: Aéropostale Incorporated, together with its subsidiaries, operates as a mall-based specialty retailer of casual apparel and accessories. It provides a collection of apparel, including graphic t-shirts, tops, bottoms, sweaters, jeans, outerwear, and accessories for 14 to 17 year-old young women and men. The company also offers casual clothing and accessories focusing on kids between the ages of 4 and 12. As of March 13, 2014, it operated 864 Aeropostale stores in 50 states and Puerto Rico, 78 Aeropostale stores in Canada, and 151 P.S. from Aeropostale stores in 31 states and Puerto Rico. In addition, Aéropostale, Inc. markets its products through its Websites, http://www.ps4u.com, and http://www.aeropostale.com, as well as its licensees operate 95 Aeropostale stores, and 1 Aeropostale and P.S. from Aeropostale combination store in the Middle East, Asia, Europe, and Latin America under various licensing agreements. The company also sells fashion footwear, contemporary apparel, and other accessories through GoJane.com. It has a strategic partnership with Sycamore Partners and MGF Sourcing. The company was formerly known as MSS-Delaware, Inc. and changed its name to Aéropostale, Inc. in February 2000. Aéropostale, Inc. was founded in 1987, has 3,900 employees, and is headquartered in New York, New York.